I'm back from my travels to Friday Harbor Laboratories - my zoologist "home base" since 1996, though only my 6th stay at the labs. The original intent of the trip was a micro-sabbatical (UGA does not have real sabbaticals, unless you find external funding for it) to write, prepare for teaching in the fall, and put my feet amidst the Fucus and Balanus again at low tide, in a habitat I know less well than I'd like but better than almost any other. My plans were interrupted. First, by good news - my work on Pisaster is recommended for NSF funding along with colleagues Mike Dawson, Lauren Schiebelhut, Ian Hewson, and Pete Raimondi. Fantastic news that required some scrambling to address a few issues before anything could be finalized, and of course made trickier by me not being at my office. So, good news for sure and you'll hear more about that in the coming few years. Then, the very next day (still in my first week at the labs), terrible news. One of the most incredible undergraduate students I've yet interacted with, Katelyn Chandler, passed away unexpectedly. She was only 20. I worked with her first as a teacher in my "Monsters" class, and then for 3 semesters in the lab where she learned how to do qPCR, genotyping sea stars, and eventually her Honors thesis on differential expression among EF1A genotypes of Pisaster. She was incredibly intelligent, engaging, diligent, and creative, and will be very much missed by all of us in the Wares lab. 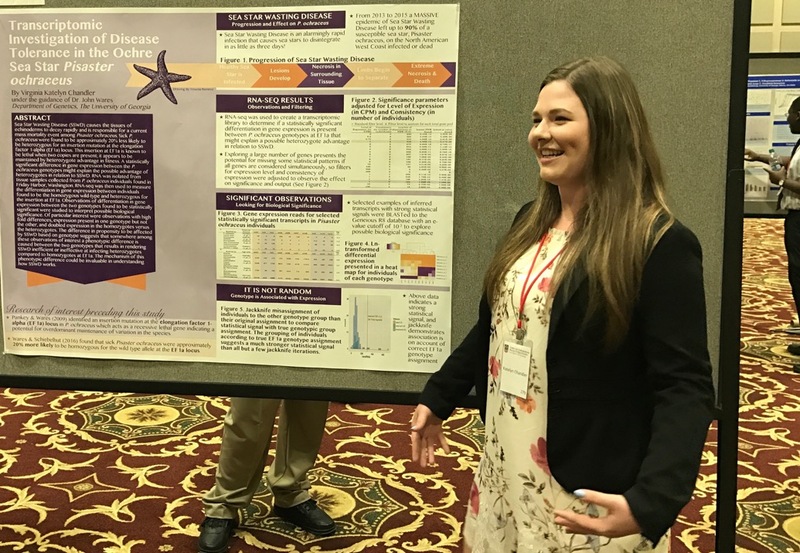 Below is a photo I took of her presenting the poster she made with almost no help (in terms of design, content, and so on), discussing science that she had done much of the creative and intellectual work on. Katelyn will receive a posthumous degree from the University of Georgia; in only 2 years at UGA she had already amassed tremendous number of credits, had completed her Honors thesis, had coauthored a scientific publication, and had touched the lives of very many.